Cholar dal is a mildly spiced creamy lentil curry prepared from split chickpea. 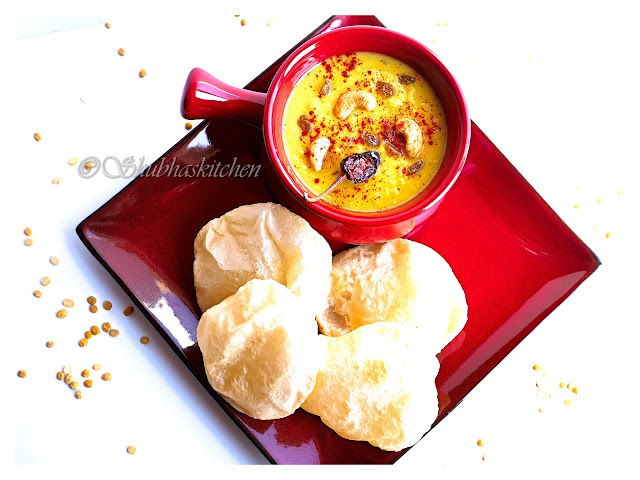 This dal is traditionally served with Luchi or Kochuri. This lentil preparation is thick in consistency but you can always adjust the consistency and serve it as a soup or as a side with some hot steamed rice. 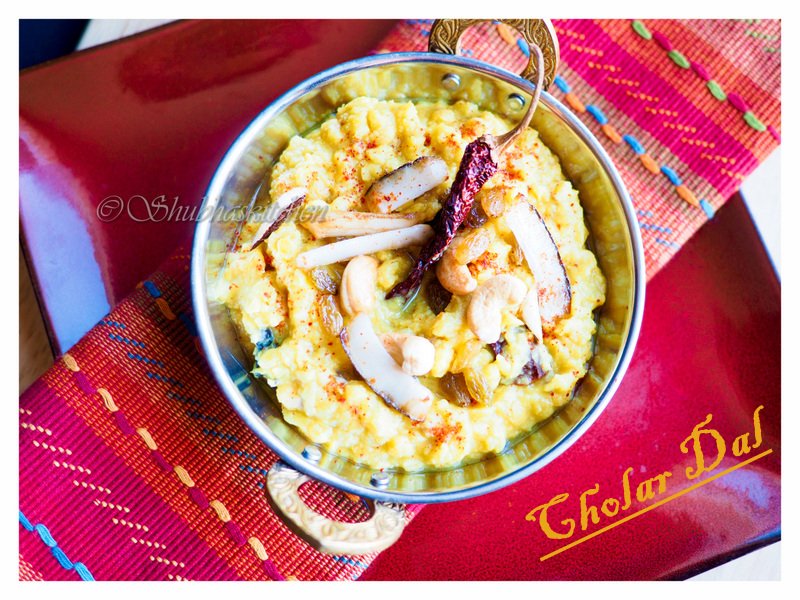 Wash the chana dal 2-3 times and soak in water for about an hour. If you are in a hurry, you can soak for half an hour in some hot water. Drain the water from the dal, add 3 cups of fresh water, turmeric powder and pressure cook the dals for about 4-5 whistles. Turn off the heat and let it stand for about 15 minutes for the pressure in the cooker to ease. 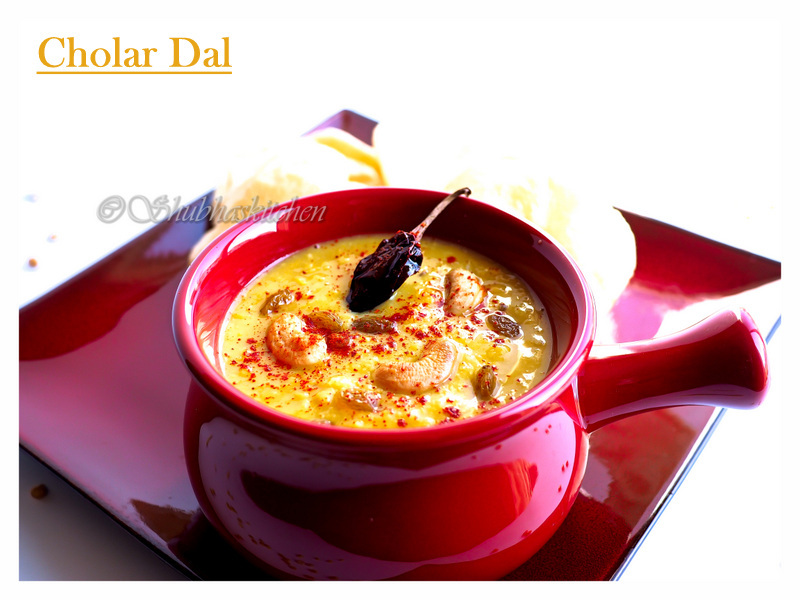 Note : You can cook the dal directly on a pot/ pan but it will take longer to cook. Take oil in a pan. Fry the coconut slices and set aside. In the same oil, fry the raisins and cashew nuts.Set it aside. Heat ghee in a deep bottomed pan. When hot, add the bay leaves, cinnamon sticks and cardamom. Fry for a couple of minutes. Now, add the cumin seeds, asafoetida, dry red chillies. Once the seeds start to splutter, add the grated ginger and freshly grated coconut and fry for a minute or two. Now, add the cooked lentils. Adjust the consistency by adding some extra water if needed (Note: This dal is not soupy and has a thick consistency but you can adjust it according to your preferance) Add the slit green chillies. Bring the mixture to a boil. Goodness. With the vibrancy of the dish, I am drooling over here. Love the recipe and the presentation too. Looks so delicious!The ghee fried nuts must have taken it to another level! 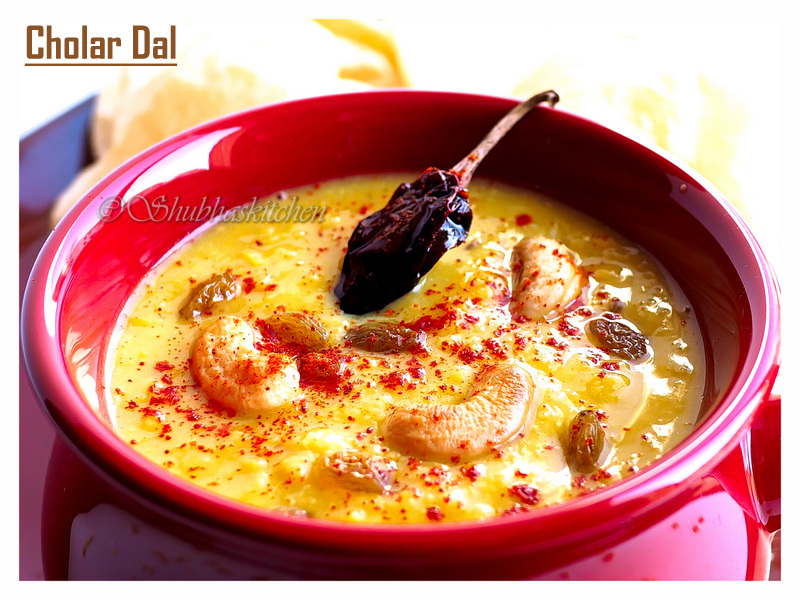 Healthy, Delicious dal with a great presentation ..